In public relations, choosing the right words to pitch a story is as important as using the right fabric in fashion design. Words bring ideas to life and paint a picture for media and other audiences, whetting appetites to learn more. There are some tips to word choice that can make the difference in whether a journalist jumps on a pitch or hits the delete button. 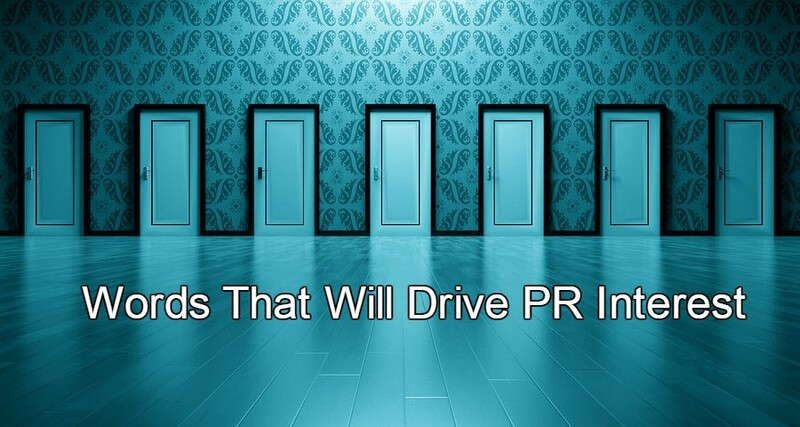 For best PR results, choose words wisely. Let news currency guide you – within reason. In the last week of December, any PR strategist with a legitimate reason to use the word “complicit” in a pitch, may have been on to something. That week, Dictionary.com, in a widely publicized move, dubbed “complicit” its word of the year. Anytime there is a connection to a word or phrase having a moment on social media, we say, go for it. A great example of a smart use of a trending word includes t-shirt companies that jumped all over the curious Presidential mistyped tweet – “covfefe.” One caveat, however: it’s not advisable to force-fit a trendy word into a pitch just to try to pique interest. That is a backfire waiting to happen. We all know never to yell “fire!” in a crowded place. The same basic rule applies when pitching a media contact. Don’t go overboard on the superlatives. Not every announcement or pitch can include “the biggest,” “the most innovative,” or “the first,” and many (“groundbreaking”) are press release cliches that sound empty. Overpromising with such headlines are another way to incite media boredom…or even ire. Dig more deeply into the story to find nuggets of interest that aren’t reliant on such boasts. For example, Matthew Flamm, a New York-based journalist was moved to cover a company called Move Loot, not based on any remarkable claims, but because the approach was simple and easily understood. The most interesting and successful pitches tell a simple story, well-crafted, to the right contact. We’ve have addressed the topic before; be ruthless in ridding your pitch of jargon and empty words. Buzzwords seem endemic to all industries, but technology may be the worst offender. (Check out this “tech jargon generator” for some great examples.) Using technobabble or businesspeak can be distracting to the reader and make the writer seem unnecessarily self-important and unapproachable. It’s much better to opt for straightforward explanations. However, if the product or service is just so technical that only a sentence like this will do — “If you neglect to parse MEAN stack, prepare to handle object-oriented analytics” – at least recognize the absurdity and offer to explain in plainer language. Say what you mean and, yes, mean what you say. In other words, strive to avoid overpromising and underdelivering. For example, many B2B tech clients are reluctant to divulge certain facts. Often, those are the facts journalists care most about, like financial data, for example. So, while a PR specialist needn’t announce to the writer that numbers will not be discussed (that’s a downer for sure), don’t string them along with hopeful “maybes” that don’t pan out. Instead, package what can be announced in a way that is positive and relevant and offer any other “pluses” like exclusive interviews with the CEO or sneak previews of a product. But first be sure you can deliver. If it’s in writing, you have to be able to stand behind it. Let brevity be your byword. Short, punchy and to the point always beats long and wordy. This goes for business writing as well as media pitching. Here’s some great advice from Bryan Garner, author of The HBR Guide to Better Business Writing. “Don’t use three words when one would do,” says Blackburn. Read your writing through critical eyes, and make sure each word works toward your larger point. Cut every unnecessary word or sentence. There’s no need to say “general consensus of opinion,” for instance, when “consensus” will do. “The minute readers feel that a piece of writing is verbose they start tuning out,” he adds. Don’t let bloated writing be the death of your next good pitch. Use past success as a guideline. We found this exercise to be useful. Review subject lines, story angles and other pitch lingo that has proven successful in the past and repurpose them where you can. We like the way this blog post makes the case for the word “frothy,” for example. A colleague swears by adding a question to any subject line, while others insist addressing a media contact by name in the subject line will help. We also like peppering in short, relevant nuggets like bold statistics. We encourage you to conduct your own experiment and see what has worked best to generate interest. PR professionals generally understand Journalism 101 and are able to communicate with writers who are “on deadline” or reviewing a press release that is “embargoed.” This is industry shorthand (as opposed to jargon) that makes communication easier and less prone to misunderstanding. While knowledge of key journalism and production terms may not make your story more appealing, it will show your acumen. Not sure exactly what MOS stands for or what a “blind interview” is? Bone up here to make sure you’re in the know.